Oh Job System, what can’t you accomplish? 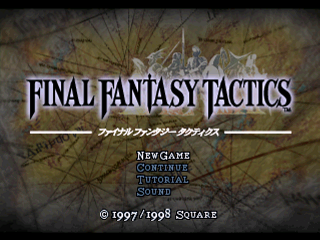 Decidedly more Tactics Ogre than FF, this spinoff decides to take the battle systems for a spin on the SRPG circuit. And it’s realized brilliantly. The game takes place on a 3D plane with 2D sprites, running similar to other SRPGs for the most part. You raise up a team of units on your own through a normal Squire or Chemist to a whole bunch of more advanced Jobs. Each one can have two action ability sets (one which the selected Job must always have, the other you can chose from any other Job you have skills purchased in), a reaction ability, a support ability, and a movement ability. There are a large amount of these, and it affords a humongous amount of customization with more depth than any other game before it with Jobs. You can even recruit monsters, who lay eggs of eventually stronger monsters. Each unit also has a Brave and Faith category, determining certain formulas. For example: a more faithful unit will heal and do more damage with magic, but can also be hurt even more by magic and if Faith gets too high they’ll leave your party to find God! Every unit can truly become your own creation, and you’ll probably be spending most of your time in the Formation screen. The plot is easily one of FF’s best, at least for the first half: full of medieval political intrigue, backstabbing, rebellion, a church vying for power, demons, and the truth behind the ending of a war. The original translation isn’t the best in the world, but there are some very memorable lines from it and it’s all quite readable. If there was one flaw to this game it’s in special characters. Eventually your hard-raised recruits are completely useless in the face of T.G. Cid. For the most part these special characters face only optional usage however because their place in the story is minimal after you receive them, though they are completely awesome (you even get to control Cloud from FFVII, which his abilities being Limit Breaks). Another thing some may bet a little frustrated with is the concept of Charge Time: the more powerful a spell, the longer after selecting it takes to cast. This can lead to some odd situations depending on the range of the spell or how close you are to enemy units, as during charge you can still get hit, your friends may accidentally get drawn into the crossfire of your Fire 3, or it may be too late for your Cure spell. Some veterans of the genre may also find this title easier than other SRPGs, since you can grind rather easily and the Job system all but requires such to get the most out of it. 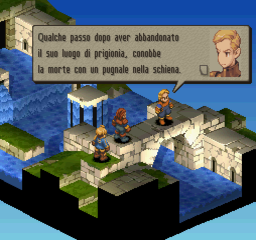 FFT is a must play for any fan of SRPGs at all, or those who love heavy character customization. Even if you don’t enjoy Final Fantasy, you’ll most likely find something here that you’re going to love. 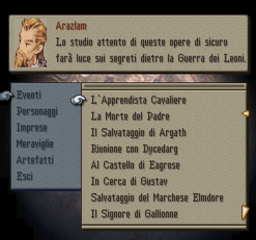 This patch translates the full game into Italian. 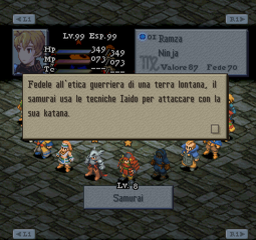 It includes translated movies, graphics, menus, and the main script. 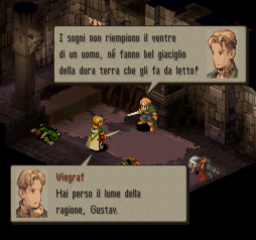 All the text and graphics have been translated from the new PSP script, and then ported to the PSX version, replacing the old and inaccurate translation. On the “hacking side”, it adds DTE to the game and extensively uses the game’s native compression, while the original game only used it on a few files. It also has some minor ASM hacks.